At Busker Guitars we take pride in providing a bespoke, personalised service for musicians and talk to everyone about their set-up needs. Inspection and set-up are undertaken in our Snowdonia workshop. This means that you get a guitar adjusted for your own playing style. If you are unsure about the type of set-up you want, then we will advise you. A "Standard" set-up for one of our guitars would be 3mm at the 12th fret on the bass side and 2.5mm at the 12th fret on the treble side, with the nut cut to a standard acoustic guitar height. The strings being 13-56 Newtones. This "hybrid" action allows the guitar to be played fingerstyle in standard tuning and easily with a slide in open D or open G.
a. Loosen all the strings just to a point where you can move the bridge around by hand with minimal effort. The cone is securely attached to the bridge but "floats" on the cone well ring, held solid by string tension during play. On Tricones the bridge and T piece "float" slightly on top of the cones as well as the cones "floating" in the cone well. b. Set the bridge so that it is in the middle of the coverplate hole and at 90 deg to the strings. c. Gradually bring the strings to pitch – Always tension strings three and four first and work outwards – That way the bridge will stay exactly where you have set it. Also, the downward pressure on the cone will always be centralised. d. Because the cone settles as you tune a resophonic guitar, expect to have to fine adjust your tuning over the first few minutes of play. How a resophonic guitar works! The cone is the heart of your resophonic guitar (or cones in the case of a tricone). They sit on a lip in the cone well and are not fixed down - simply held in place by the down pressure of the strings. This means that the correct downpressure is essential to the way the guitar resonates. Three aspects ensure the correct pressure - neck angle, break angle over the bridge, and string gauge for a particular tuning. These features all differ from a standard acoustic guitar, which is why many standard acoustic guitar manufactuers' offerings in the resophonic arena lack tone and volume - they just don't fully understand the design requirements. The cone itself is absolutely crucial to achieving that great, warm "valve" sound we love. I call it "acoustic overdrive". Getting the right metalergic mix of aluminium, correct thickness for the instrument and then hand spinning cones is an art form. The cones fitted to all Busker Guitars are Continental style - hand spun to a European design. These cones provide great dynamic range and a lush, creative tone for you to mold to your style of play. Cones need to settle and, just like good tonewoods, they seem to improve and "open up" after a few months of play. What strings are fitted to my Guitar? At Busker Guitars we fit medium gauge 13-56 (13, 17, 26w, 36w, 46, 56w) string as standard to all our guitars. This allows the guitar to be played in standard tuning and the popular blues lowered open tunings of open D (DADF#AD) or open G (DGDGBD), with or without a slide. Medium gauge strings provide enough down pressure on the cone to make the guitar “sing” and give a usable, solid tone with a slide. Normal acoustic guitar “lights” (12-54) just don’t cut the mustard on a traditionally built resophonic guitar. If you are going to keep your guitar in DADF#AD or DGDGBD and play solely with a slide (many guitarists buy a resophonic guitar specifically for this purpose) then we would recommend strings in 15-56 (15, 17, 26w, 36w, 46w, 56w). A .15 first string can be just a little heavy to work with in standard tuning but is slightly easier than a .13 for slide. There is really no need to go any heavier with your strings – as you will start to loose tone and sustain. Better to work on your technique so you become adept at creating volume and solid tone from 13-56 or 15-56 sets. Tricones - There are exceptions to every rule. If you are going to keep your tricone in lowerd tunings and play slide, then you may want to try 16-59 string sets. Tricones seem to savour that extra beef! If you want to play in raised tunings of open E (EBEG#BE) or open A (EAEAC#E) then we recommend a custom set of strings consisting of light bottoms and medium tops (13, 15, 24w, 34w, 42w, 52w). Remember to tune back to standard before putting your guitar away. A far simpler way to play in open E or open A is to tune a medium set of strings (13-56) down to open D or open G and cappo at the second fret. 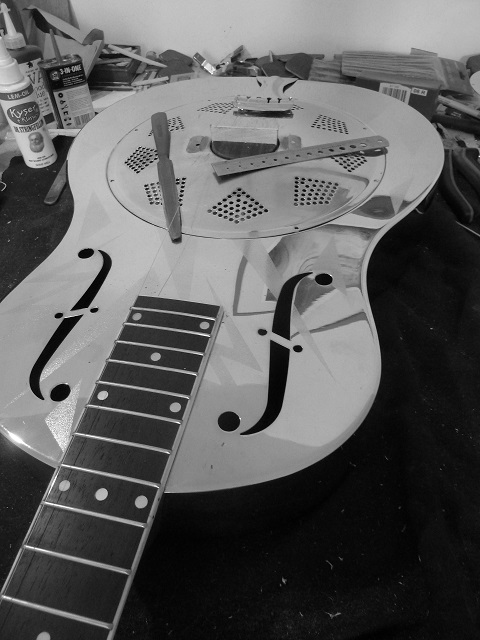 Round neck resophonic guitars are not suitable for “dobro” high bass G tuning (GBDGBD) – for that you need a square neck guitar. Should I Choose Phosophor Bronze or Pure Nickel? Neither is “better” than the other but they are very different – it is down to personal choice. Phosophor Bronze strings are rich and full in tone. They a “warmer” than nickel strings and carry lush overtones and plenty of bass. PB strings offer great tonal range plus easy-playing flexibility and consequently they tend to be a more popular choice than pure nickel. We fit Phosophor Bronze strings as standard to all our guitars. Pure Nickel strings give a slightly harder sound than phosphor bronze. The strings have less overtones and more individual note clarity than PBs but carry less bass. Some players like pure nickel for their “old time” tone and the “physicality” required to play them well. They sound very “Delta” on a steel-bodied guitar. Pure Nickel strings are avaiable by request. Bottleneck slides come in various materials (eg glass, brass, ceramic, steel,) but as far as resophonic guitars go there is only one rule – MAKE SURE IT'S HEAVY. Lightweight Pyrex or thin metal slides are OK for electric guitars but will not produce a rich tone on a resophonic guitar and will sound weedy, wasting the potential of the instrument. It is really worth hunting around for a good slide. One of my old favourites is the Mike Dowling Signature slide cut from a large Mateus Rose bottle by Diamond Bottlenecks. Diamond Bottlenecks produce some excellent glass slides, hand cut by a crew who love resophonic and slide guitars. Their web site is well worth visiting - and they provide a great personal and friendly service! Ian McWee of Diamond Bottlenecks has come up with something a little special for Busker Guitars. He has found a supply of Italian cobalt blue glass bottles (in pure soda lime from the top glass making region in the world). And he has cut the exquisite Busker Blue Diamond that is available from Diamond Bottlenecks. This slide has a big tone and is an absolute pleasure to play. All Busker Guitars can be played lap style in dropped open tunings using a nut riser and lap-style slide or “steel”. There are two main types of lap slide steel: a bullet nosed round bar, which is very traditional and favoured by many for all styles of lap slide playing; and a “railroad” shaped bar, often with sharp edges for the fast runs and pull-offs that is favoured by Bluegrass players. Realistically, both styles of bar are adaptable to play a wide variety of lap style slide music – the choice is very much personal. I like the “railroad” style of bar like the Shubb SP2 – simply because I find them a little easier to hold. I don't think that any resophonic guitar player hasn't suffered from mysterious rattles and buzzes occuring in their instruments at some time or another. And they can be very frustrating to track down! Resophonic guitars involve the whole guitar in producing their tone - cone, bridge, body, neck, cover plate - just about every part amplifies and changes the sound. Rattles and buzzes can just appear - Put your guitar to bed at night sounding perfect, and it can wake up in the morning with a cough! The most common rattles come from where the string windings pass over the bridge or from the string balls vibrating against the body where they go through the tailpiece. However, a string ball or winding buzzing near the bridge can sound like you have a chainsaw hiding in the headstock!!! Like I said, these things are frustrating! However, the good news is that 95% of these mysterious rattles and buzzes can be solved through a quick de-tune (by a couple of steps) and re-tune of your guitar. Remeber to de-tune from the outer strings inward (1st and 6th) and re-tune from the middle strings outward (3rd and 4th) to keep the pressure on the cone centralised. Give Busker Guitars a call (01654 712671) - or visit one of the specialist resophonic guitar forums like Michael Messer's for further advice.